Shopping for Hobbit / Lord of the Rings Statues? There's no hope for this cursed soul... but there is for your collection! Ringwraiths are creatures of the twilight world and this one is no exception. To most, they appear as black-robed figures on horseback, but wearing the One Ring, Frodo sees them in their true form: wretched husks of their former selves; tall, thin, and sapped of mortality; pale, twisted masks of the will of Sauron. Standing a full 11-inches tall, this striking resin sculpture from Gentle Giant features beautiful, flowing lines, praiseworthy attention to detail, and a matching themed base. 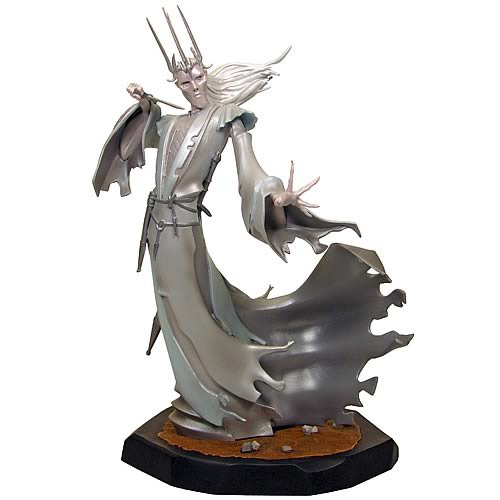 It's a limited edition, so make sure the Twilight Ringwraith is part of your collection! Limited edition to 1,000 pieces. In J. R. R. Tolkien's Middle-earth legendarium, the Nazgûl (also called "Ringwraiths," "Ring-wraiths," "Black Riders," "Dark Riders," "the Nine Riders," or simply "Riders" or "the Nine") are 9 human kings who have succumbed through greed to Sauron's power and attained immortality as wraiths bound to the power of the One Ring as servants of The Enemy. They are first mentioned in his book The Lord of the Rings, originally published in 1954–1955. The book refers to the Nazgûl as Sauron's "most majestic men." This article uses material from the Wikipedia article "Nazgûl" and is licensed under the GNU Free Documentation License.